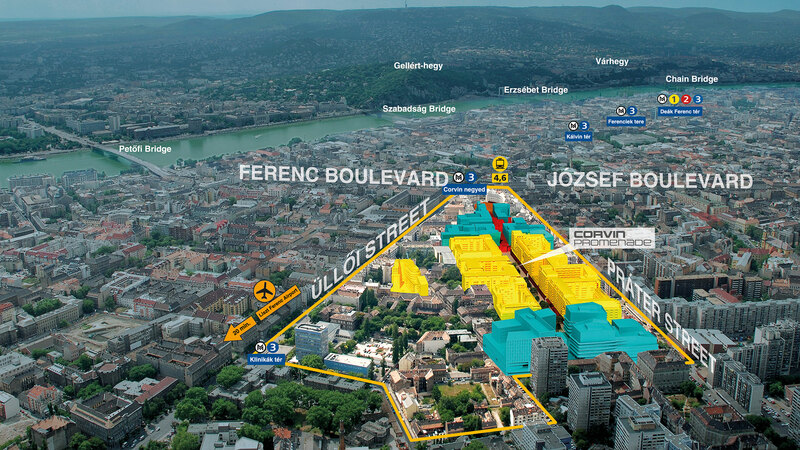 Central Europe’s largest, 22-hectare city centre regeneration project in the heart of Budapest, and Budapest’s largest ongoing development with a total area of 500 000 sqm built on so far. The project has been financed with EUR 850 million from private sources, as well as EUR 72 million from European Union community funds (for new infrastructure, new public spaces, social housing programs, etc. ), built with the close cooperation of the Józsefváros Municipality and Budapest City Council. 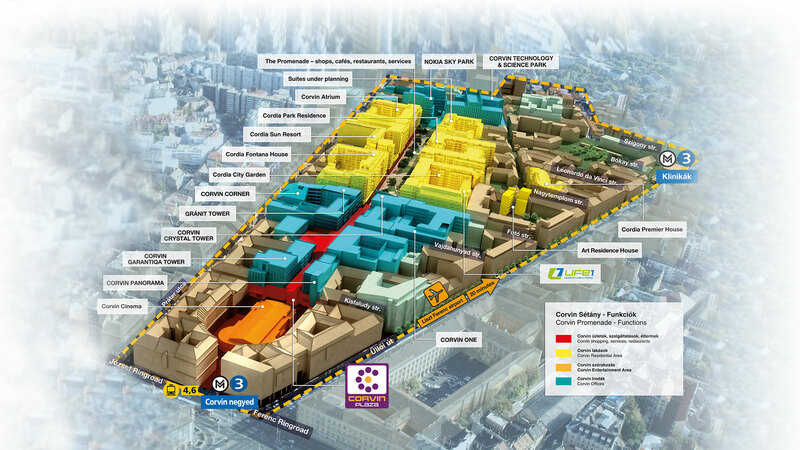 The area contains the capital city’s largest city center office and retail development, with a unique combination of open and covered shopping, entertainment, leisure, sport and eating facilities. The Corvin Quarter contains more than 2700 new homes and a Promenade, an 800 m-long pedestrianized street, with 10000 sqm of green spaces and public areas, that has become a new symbol of Budapest. This ensures the necessary green areas and a carefully planned local area with a wide range of services for residents including shops, restaurants, a gym, a swimming pool, theatres and a cinema. The regeneration of the Kelenföld area is one of Europe’s largest public transport brownfield investments, the scope of which includes the Etele Plaza retail park, transport developments and the creation of the Budapest ONE Business Park. Kelenföld is part of Budapest’s 11th district and is known as the western gate of the city. The Kelenföld train stop Railway Station and the adjacent bus station have several routes serving Western Hungary, while nearby motorways extend to Western and Southern Europe. The terminus of the now-completed Metro 4 line is also located here, making this space Central Europe’s largest and most accessible transport hub. The new centre of this area will develop in the district over the next few years, as both state and private investment are implemented. The project’s total area covers 36 hectares, with more than 750 000 square meters of residential, office and retail property development planned in partnership with other developers. There is also the possibility for constructing landmark buildings in line with the new, important role of the location. Cordia is Hungary’s leading residential property developer, with several completed and ongoing development projects both in Hungary and other countries in the region (Romania, Poland). Cordia is a subsidiary of the highly capitalized, Hungarian-owned Futureal Group, one of Central Europe’s largest property development and investment groups.